Tank risers are extensions of the existing tank lids. They replace the existing tank lids, bringing the access ports of the septic tank to, or just below the ground level. Tank risers virtually eliminate any digging involved to expose the tank lids for pumping. Alpha Omega can easily pump most tanks in less than an hour, if it is equipped with tank risers. Additionally, in emergency cases, the tank can be accessed quickly, without delay. Finally, tank risers promote regular maintenance due to the ease in access. 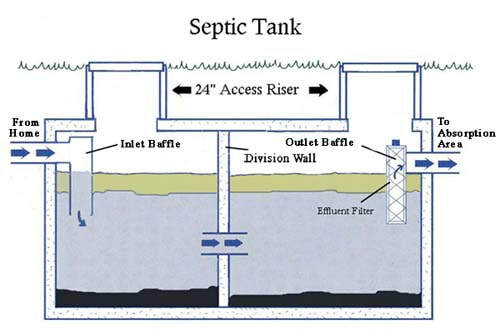 Regular septic tank lids, that do not extend up through the surface of the ground, are required to be buried at least six inches below the surface to prevent gases from escaping. But tank risers come with a built-in gasket to keep the gases contained inside the tank, thus allowing the lid to be uncovered and accessible. We offer risers twenty-four inches in diameter to allow the tank to be properly and completely serviced in the most efficient manner. ​The installation involves adhering the riser to the tank with concrete, both to strengthen the connection and to prevent roots and water from entering the tank. They are constructed of a high-grade, UV protected plastic. However, tank lid risers are not designed to be driven on, as they can not withstand the weight of a vehicle.